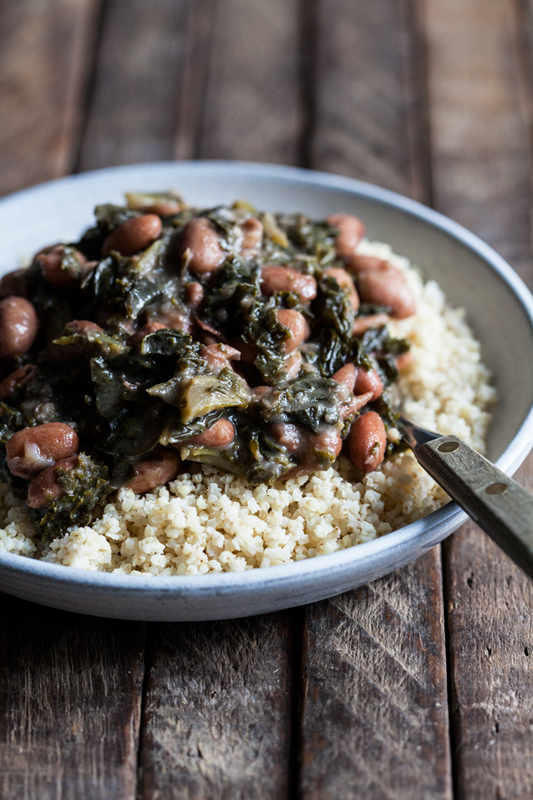 I was originally going to call this recipe what it actually is, which is braised cranberry beans and kale. I don’t cook cranberry beans as often as some others, but I do love their creamy texture, and I tend to get them during the holidays because their mottled, white and red exterior (which becomes pink as they cook) always strikes me as being appropriately festive. 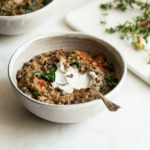 As I was making the recipe, though, I realized that one of its upsides is that it can be made with pretty much any bean you’ve got: navy beans, cannellini or great northern beans, black beans, chickpeas, pinto or kidney. This is truly more of a cooking template than a recipe, but I like it so much—and am so sure I’ll be making it regularly from now on—that I couldn’t help but share it. My normal process for batch cooking beans is to soak them overnight, then boil them till tender. I like this because it allows me to use the beans any which way: I haven’t really seasoned them, so they’re a flexible addition to any recipe. 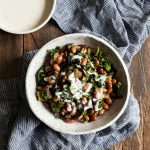 There’s a lot to be said, though, for cooking them this way, with lots of onion and garlic and salt: the beans take on more flavor, and they end up having a stewed consistency that’s really lovely. 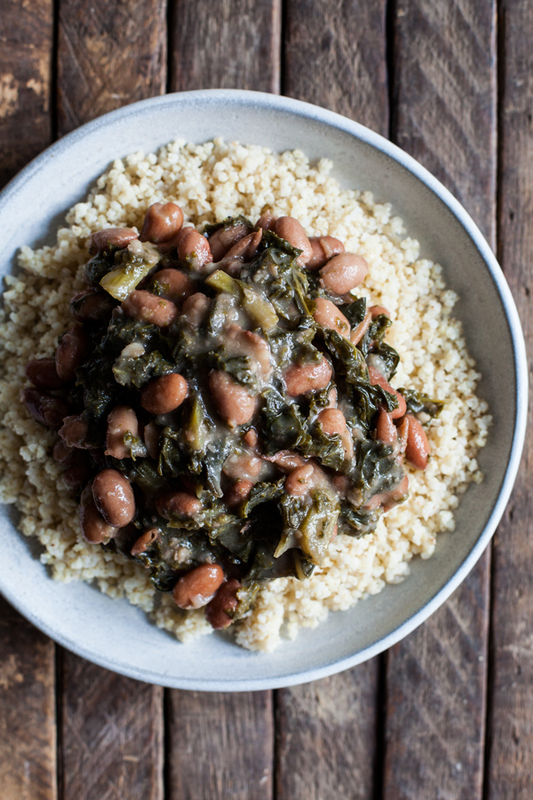 Braised beans aren’t as blank a canvas as plainly boiled ones, but they’re still flexible: you can mix them with a grain, serve them over toast, or use them as a side dish at dinner. The other part of this recipe is the kale, which gets cooked down until it’s practically melting. Normally when I add kale to meals, like soup, I give it about 10 minutes of simmering, which is nice because the greens hang on to some of their texture. But there’s an upside to long-cooking kale, too: not only does it become wonderfully soft, but it also becomes incredibly sweet. It’s a good trick for anyone who finds the bitterness of kale (or other leafy greens) to be off-putting. And I’ve got another batch in my weekend cooking plan already, leftovers of which will join me at my mom’s on Sunday and Monday for simple lunches. Here’s the recipe. Soak the beans overnight, or for 8-10 hours. Drain and rinse them. Heat the oil over medium heat in a large soup or stock pot. When the oil is shimmering, add the onions. Cook for 5-7 minutes, or until the onions are tender and clear. Add the garlic and cook for another 2 minutes, stirring constantly. Add the beans, 7 cups water, and bay leaves to the pot. Bring the beans to a boil, then reduce the heat to low. Cover and simmer for 45 minutes. Remove the bay leaves. Add the salt and kale to the pot (you may need to add the kale gradually, stirring as you go, in order to wilt it down and fit all of it). 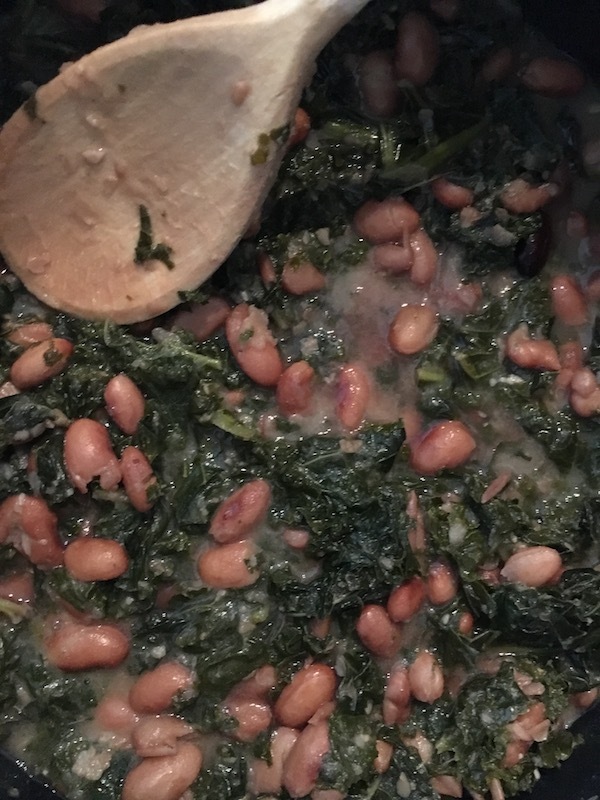 If the mixture you have is too thick, add an extra cup or more of water: you want the beans and kale to be less soupy than a soup, but still pretty soupy. *How much salt you need will vary according to taste, health needs, and which type of salt you use. I used a little over 1 1/2 teaspoons of Diamond Crystal kosher salt, but 1 teaspoon of fine sea salt would be comparably salty. Leftovers will keep in an airtight container in the fridge for up to 5-6 days. They can be frozen for up to 6 weeks. I’m as distracted as anyone right now with cookies and cakes and festive, show-stopping vegan entrees, and I’ll be making some of those this coming weekend. This past week, though, as I wrapped up my semester (!) and tried to tie up loose ends at work before the holiday, I couldn’t have asked for anything more grounding than this great, big nourishing pot of goodness. Hope you’ll find it as easy and tasty as I did. And I’ll see you on Sunday. Yumm. My kids absolutely loved braised bean recipe. This one is definitely a keeper! Pinned. I love simple, cozy recipes like this! I’m making it now— the beans are simmering away. Planning to add in a bit of cabbage since i don’t have the full amount of kale. Hope you enjoy it, Emma! I bet cabbage will be a delicious addition. 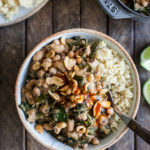 I usually add my greens during the last few minutes of cooking as well, so I’m especially interested in trying your method here of cooking them longer. Your description of them becoming softened and sweet sounds wonderful. What a wonderful post for the new year- comforting, cozy, and so nourishing. I just ordered a big box of rancho gordo beans and I’m so excited to cooking with more varieties this year. Happy new year, Gena! This was delicious! I really love the kale this way- I’ll have to make it again. I followed the recipe exactly, and added a drizzle of lemon-tahini dressing when I ate it which made the broth even richer- I ate it with a spoon tonight but I think I’ll make some short-grain brown rice and sauteed mushrooms to add tomorrow. Awesome, easy, healthy recipe! I’m going to try this in my Instant Pot – I’ll let you know how it turns out! I used vaquero beans from Rancho Gordo that I had made previously in the Instant Pot. Extra garlic. Sauteed the stems before adding the beans and rest of the kale. The splash of red wine vinegar makes it, so don’t forget that. Really yummy and filling.